Using Kate Flecther’s (2008)* discussion around the value of local resource flows as a starting point for sustainable design, this project begins to explore a place-based approach to sustainable materials design. The project so far has aimed to develop new materials concepts using flax fibre cultivated in the Midlands UK. An interdisciplinary approach was taken incorporating methods from textile design, craft and materials science. 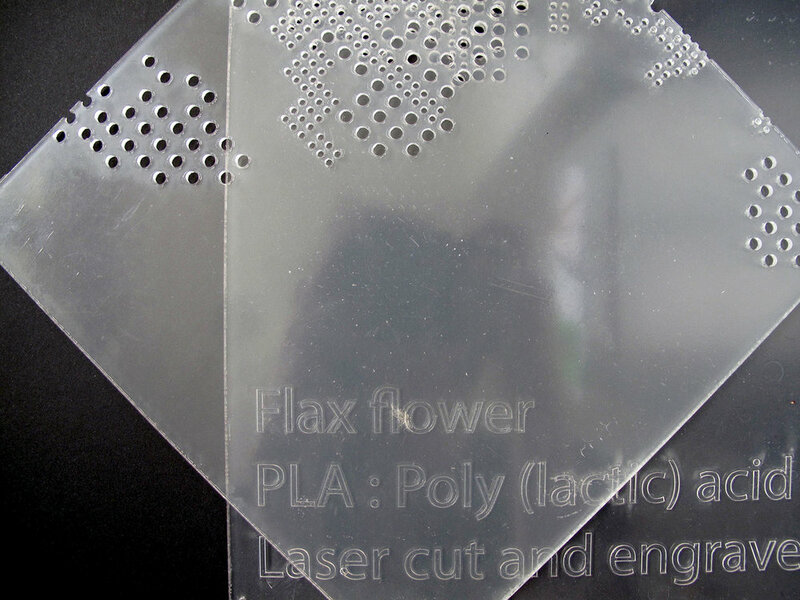 The work to date has resulted in a flax and PLA composite material concepts using nonwoven techniques, compression moulding and laser processing, that have the potential to be applied within a range of product contexts. The notion of 'craft as connector' in the emergent field of materials design has been proposed through this work. Several works for exhibition were developed from the project including: Local Narrative (2010) in Material Actions; Essamplaire (2011) in Ambience 11; Sampler (2013) in Talking Textiles; and Notlace 1 and 2 (2011) , Laser cut flax and poly-lactic acid nonwoven and compression moulded samples (2015 ) in TRIP. The work was funded by Loughborough University Materials Research School and the project team included myself, Dr Noreen Thomas, Dr Abdul Shakoor and Dan Vardy. The initial work was reported on in ‘The Significance of Craft in the Development of Sustainable Materials: Localism, Digital Technologies and Emotional Durability’ (Kane et.al 2011) published in the Making Futures Journal, Volume 2. Connecting with Local Resource Flows, an overview of the ongoing project, was presented at In This Place, Cumulus 2016, Nottingham Trent University, UK (Kane 2016). And, 'Materials Design for Sustainability: Connecting with Local Resource Flows through the Development of Flax based Composites' will be published in Craft Research Journal in 2017. 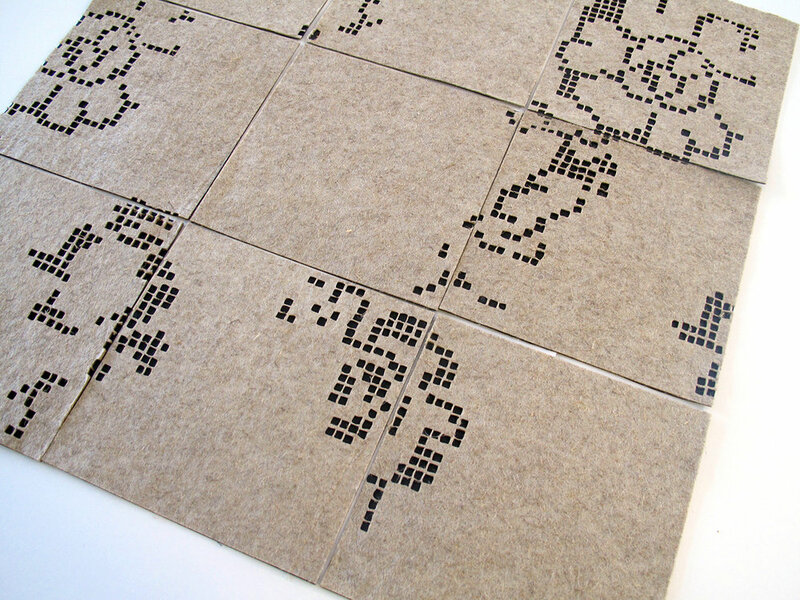 Essamplaire was included in the Ambience 11 exhibition at The Textile Museum of Sweden in November 2011. The piece uses the findings of the FLAX/PLA Composites project and considers the format of a traditional textile sampler as a means of documenting and presenting textile design research. . The exhibition ran alongside the Ambience 11 conference, held at the Swedish School of Textiles in Boras, which focused on the intersections and interfaces between technology, art and design. The exhibition catalogue includes a short essay, ‘Essamplaire: an approach to working at the technology | art | design interface in textiles’, co-authored with Noreen Thomas, Abdul Shakoor and Dan Vardy. A textile sampler was in its origin, a piece of embroidery work produced as a record or demonstration of learning and skill in needlework. Established during the 15th – 16th centuries, it was originally a pattern book in the form of a piece of linen onto which new stitches, techniques, designs and colour combinations were worked. The form and function of the sampler has evolved over its long history making it a vehicle for multiple creative intentions. Its form has changed to embrace aesthetic functions relating to expression and ornamentation alongside the documentation of material, colour and technique. Further to this, the sampler has often provided a site for the communication of social and cultural values within the domestic sphere. In parallel, textile practice and research often has multiple intentions and outcomes. It often involves the exploration and documentation of new technical processes and materials alongside aesthetic goals that sit within broader social, environmental, cultural and technological frameworks. This suggests that the production of samplers provides a focus for technical documentation and aesthetic expression as well as providing a vehicle for the communication of social, environmental and cultural values. Local Narrative, considers the notion of localism within the context of sustainable development, through the lens of textile practice. The piece draws on the assumption that textiles impart meaning through visual and material languages. An outcome of the FLAX/PLA Composites project, it explores the use of materials and motifs local to the Midlands UK to provoke a sense of connection with land, region and place. It was exhibited in Material Actions at the Viewpoint Gallery Plymouth 9 -23 October 2010 and the Centre for Contemporary Art and the Natural World, Exeter UK 27 November 2010 – 27 February 2011. The exhibition went on to be shown at Go Create, Bristol UK and Bath Spa University, UK. The exhibition showcased the work of 13 UK based artists and designers and aimed to question how textiles are used actively to affect and contribute to ethical, social, cultural and environmental change. Sampler was included in the Talking Textiles and Telling Tales series of exhibitions held at the Shire Hall Gallery in Stafford UK between 10 January and 10 March 2013. 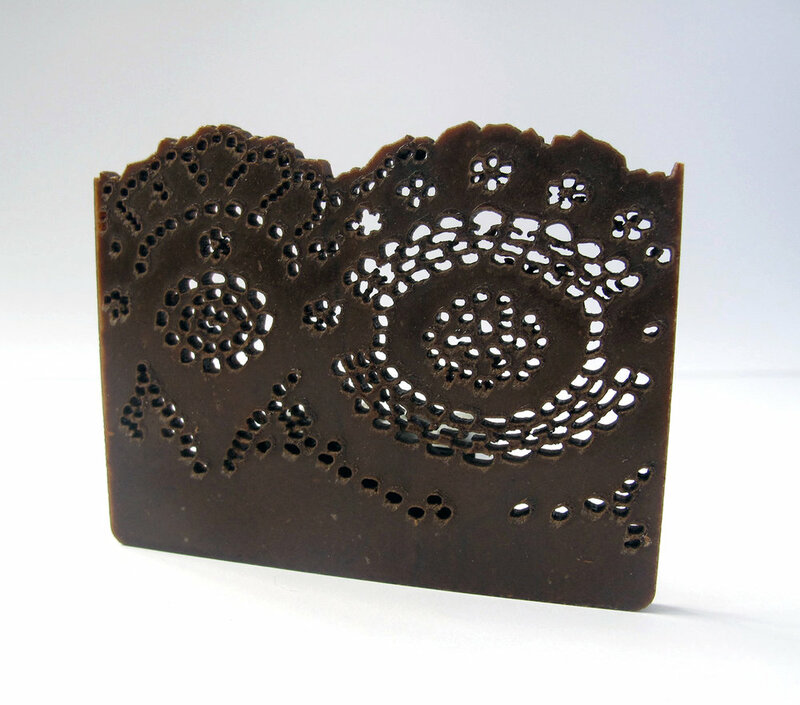 The piece, which comprised of six laser processed polylactic-acid (PLA) tiles patterned with imagery derived from drawings of flax flowers, was informed by the results of the FLAX/PLA Composites project. 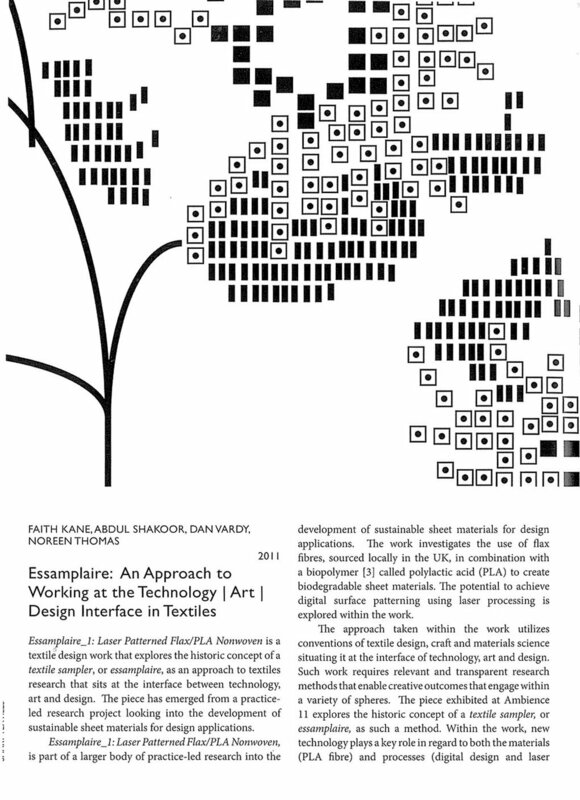 Like Essamplaire 1 (2011) and Notlace 1 and 2 (2011), Sampler (2013) explores means of presenting the results of textile design research by referring to traditional textile documentation methods such as samplers and guard books.